2.1. People generate, capture, share, and apply knowledge, primarily through human interaction. 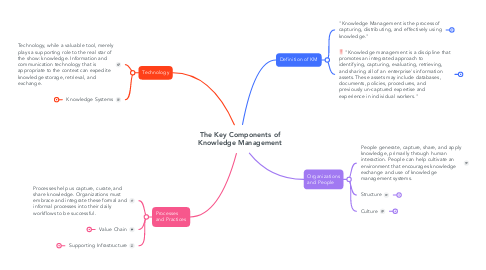 People can help cultivate an environment that encourages knowledge exchange and use of knowledge management systems. 3.1. Processes help us capture, curate, and share knowledge. Organizations must embrace and integrate these formal and informal processes into their daily workflows to be successful. 4.1. Technology, while a valuable tool, merely plays a supporting role to the real star of the show: knowledge. Information and communication technology that is appropriate to the context can expedite knowledge storage, retrieval, and exchange.